The CBS News Bureau of 1941 had already compiled an extraordinary organization. Murrow's legendary contretemps with Senator Joseph McCarthy on See It Now signaled the beginning of the end for Senator McCarthy and his fascist, fearmongering house of cards. CBS News' The World Today spawned numerous excellent news specials and regular broadcasts over the legendary history of the CBS Radio News Bureau. The hands-down standouts from CBS' Radio News division over the years that spanned the Golden Age of Radio were commentators H.V. Kaltenborn, Raymond Gram Swing, Elmer Davis and Edward R. Murrow. The Golden Age of Radio spanned some of the most momentous news events of the Twentieth Century: the aftermath of World War I, The Wall Street Crash, The Great Depression, The League of Nations, the establishment of The United Nations, World War II, The Korean War, and the Cold War Era. Competition for Radio news coverage of all of these historical eras was predictably stiff. NBC, CBS and MBS were the major players during this era. ABC came to the Radio news arena somewhat later during the Golden Era of Radio news coverage. News coverage during the rise of the Nazi party and the lead up to World War II was especially well covered by all three major networks of the era. Competing news bureaus, both independent and print media, kept a steady flow of fascinating coverage throughout the lead up to World War II, its prosecution and aftermath. But CBS News, in particular, was remarkably effective at consistently 'scooping' its Radio network competitors. 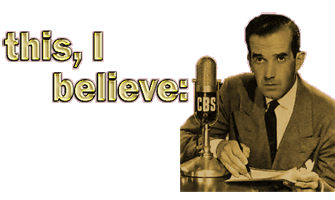 Indeed, CBS even went as far as to rewrite broadcasting history on a few occasions, as with its attempt to take credit for the first breaking news about Nazi Germany's first acts of War during World War II. 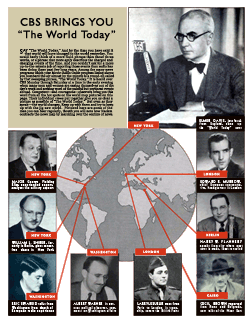 CBS' preeminence in Radio News, whether deserved or perceived, remained legendary throughout the 1940s and beyond. But by far the most legendary of CBS' numerous Radio legends of the era was Edward R. Murrow and his 'boys.' Murrow and Murrow's Boys captured the imagination of America throughout the lead up to the U.S. involvement in World War II, as well as America's prosecution of the War. Throughout World War II, Edward R. Murrow and his 'Murrow's Boys' remained an iconoclastic, straightforward, no-nonsense journalistic team. The 'icons' in this instance were CBS Radio's existing policies, especially its long-standing proscription against 'recorded interviews and sound bites.' Murrow's repeated push-back against CBS' policy on the use of recordings in News resulted in some of the most effective and stirring reporting ever heard for their day. Murrow fought hard to keep his team's journalism 'pure' of any commerical, political, or corporate taint and pressures. This was no mean feat at CBS, especially during the years immediately following World War II. CBS' exponentially growing empasis on its corporate image, bottom line, and stockholders began to create a growing rift between the ideals of its News team and CBS corporate interests. One by one, 'Murrow's Boys' were becoming systematically hobbled, edited, or silenced altogether whenever their investigative journalism ran afoul of CBS' growing emphasis on the network's corporate identity or commercial success. Edward R. Murrow had always resisted any commercial or sponsor pressures on his reporting--the one possible exception being International Silver during World War II. Murrow long preferred that all of his productions be broadcast sustained by the network. Naturally, as Murrow's popularity continued to arc, sponsors continued to stand in line for a chance to associate themselves and their products with Edward R. Murrow's reputation, fame and popularity. For Murrow's part, he saw nothing to be gained by associating his 'name' with corporate or commercial interests as they affected his journalism--quite the contrary. CBS for its part, was continuing to tighten its editorial control over Murrow and his team throughout the 1940s and 1950s. Murrow's continued clashes with those sponsors which he was forced to accept during the post-War period created a growing disaffection in Murrow with the direction in which his beloved CBS News was shaped, controlled and hamstrung by CBS Corporate. The friction was all the more pointed owing to virtually all of Murrow's productions routinely finding themselves in the top four highest Hooper-rated programs throughout the period. Murrow's journalistic independence had struck a chord with America--and the World--throughout the 1940s and 1950s. But with CBS Corporate--not so much. The skirmishes between CBS Corporate and its more independent and idealistic journalists cropped up throughout The Golden Age Radio--and indeed the fifty years that followed. But it was that very independence and idealistic spirit that Murrow wanted America to connect with and relate to. Murrow was continually coming up with all manner of new ideas for showcasing both the inherent strength of the American spirit, and that of all free-thinking citizens of the world. This I Believe was one of eight such projects that Murrow was promoting at the time. This I Believe was the only one of the bunch to get the green light. "the living philosophies of thoughtful men and women, presented in the hope that they may strengthen your beliefs so that your life may be richer, fuller, happier"
This was an ambitious undertaking, to be sure. Given Murrow's by then long established journalistic integrity and idealism, the concept was entirely in keeping with Murrow's own, admittedly evolving beliefs. Murrow recognized the distractions that The Cold War, the Atomic Age, and a resurgence in the tactic of fearmongering were becoming to the American people. This was yet another of Murrow's attempts to push back against fearmongering of any kind, while at the same time encouraging America to trust in their own deeper beliefs, convictions, values, and independent personal philosophies. 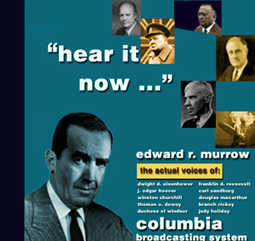 True to his word, Murrow assembled a stunning cross-section of personalities, professionals, businessmen, sports personalities, tradespeople, first-responders, artists, academics, politicians and thinkers to radio receivers across North America in what would become hundreds of five or fifteen minute tape-recorded broadcasts of his essayists' personal beliefs and philosophies. Murrow also produced showcases of the philosophies of the greatest minds throughout the history of mankind. These five and fifteen minute vignettes gave voice to the inner feelings, beliefs and personal philosophies of tens of millions of listeners throughout North America--and eventually throughout the BBC--many of whom shared the beliefs, ideals and philosophies related in these short essays. Thus, individuals great and small could hear--spoken outloud--the inner beliefs and personal philosophies they found they often shared with the rest of humankind. This was a very calculated attempt by Murrow to remind his listeners to remain in touch with their own personal philosophies and beliefs, in spite of the growing impact and reach of corporate and political 'messaging' throughout a period of great anxiety and turmoil. It was a chance to remind his listeners to trust their own deeper beliefs and values and to encourage them to cling to those inner voices and philosophies so as to push back against the orchestrated fearmongering of the era. CBS premiered the series on September 24, 1951, in a late night 11:30 pm EST timeslot for the first twenty-five broadcasts--in a five-minute, Monday through Friday format. Fully six of those first, five-minute, late night broadcasts were preempted for one public service message or another. The twenty-sixth broadcast moved the WCBS, New York series to the 5:55 pm EST timeslot, where it remained for the duration of its first run through the Spring of 1955. On the West Coast, the series aired from September 1951, forward, over CBS' KNX Radio in Los Angeles, in the 10:55 pm timeslot and the five-minute format, Monday through Friday. The series began airing throughout the Midwest in February of 1952 at various times throughout the region. Those broadcasts aired in various combinations of five and fifteen minute formats, as a predominately three weekday or Monday through Friday broadcast, often airing on Saturdays as well. The essayists were strikingly candid in their personal accounts, many of them revealing, for the first time publicly, their most intimate personal philosophies, values and beliefs, and often the events that shaped those beliefs. Each interviewee/essayist was paid one dollar, through a foundation established by co-creator, Ward Wheelock, an advertising executive and close friend of Murrow. Wheelock's foundation also bore the expenses of the production and staff in obtaining the essays and interviews. The essays were, in many instances, in stark contrast to the public personae depicted by the more famous personalities in the series and their publicists. As with most of Murrow's signature interviews, his own journalistic and personal integrity inspired many of his essayists to open up, publicly, in ways they'd never thought they could in such a format. This was perhaps the source of the series' greatest enduring impact. Murrow introduced the first hundred or so essays himself, later sharing that responsibility with his producer/editor, Ed Morgan, and about midway into the series, turning most of the production over to Raymond Gram Swing. 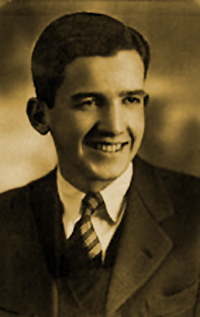 Murrow's pick of Raymond Swing was yet another of Murrow's more heroic decisions of the era. Swing had, during the organized labor and Communist fearmongering of the late 1940s and early 1950s, been all but blacklisted by CBS and the infamous publications, 'Counterattack' and 'Red Channels.' Swing had subsequently resigned from The Voice of America as well, due to Senator McCarthy's typically unfounded attacks on Swing's character. But Murrow trusted both his instincts and Swing's character and in spite of CBS' opposition, Raymond Gram Swing assumed the bulk of the This I Believe interviews and workload from about mid-1953, forward. And in fact, throughout the 1950s, Murrow's projects continued to mount at CBS. Murrow had, for some years by then, begun to permit ghostwriters for his various news broadcasts. His Television projects, See It Now and the subsequent Person to Person were also occupying a great deal of his time and resources. Person to Person, for its part, was a logical extension--over Television--of Murrow's highly effective This I Believe interviews. 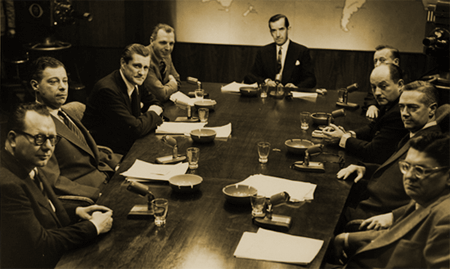 In the late 1950s, with Edward R. Murrow and CBS almost continually at loggerheads over journalistic integrity and independence, Murrow's growing disenchantment with corporate influence over broadcast journalism increased even further. True to his own beliefs and personal integrity, in 1961 Murrow accepted President John F. Kennedy's offer of the position as head of the United States Information Agency, the producer of Voice of America. 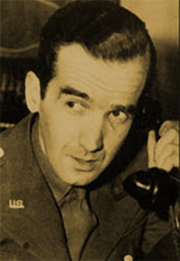 Murrow remained with the USIA until his mounting battle with lung cancer forced him to step down. Edward R. Murrow, in his then capacity as the Head of the United States Information Agency, introduces 1961's 'The Challenge of Ideas.' Watch it here or download it here and Part II, here. Of note, as is often the case with programming of 50 years ago, are the often chillingly similiar dynamics of the 21st Century. Edward R. Murrow left a very personal imprimatur on This I Believe. Though overwhelmingly a showcase of the personal beliefs, values and philosphies of hundreds of others, there's no mistaking Murrow's idealism and personal integrity in creating this remarkable series for an entire world troubled by the juxtapostion between what they were being sold, told or persuaded to believe and their own deepest held beliefs and values--values, beliefs and convictions that sorely needed validation. This remarkable series brought that validation to literally tens of millions of listeners. We often make the observation that much of the programming content throughout The Golden Age of Radio is as timeless and thought provoking in the 21st Century as it was in the mid-20th Century. Nowhere is this observation more accurate than in This I Believe. Run Dates(s)/ Time(s): 51-09-24 to : CBS Radio [WCBS]; At least 800 original, 5-minute interviews; 11:30 pm, then 5:55 pm [10:55pm in Los Angeles], Monday through Friday. RadioGOLDINdex, Hickerson Guide, National Public Radio, Tufts University Edward R. Murrow's Archives, and Tufts' Edward R Murrow Audio Collection. There are two problems with the above sequencing. Goldin cites the above nine as the first nine programs. 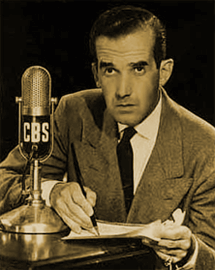 Edward R. Murrow's introduction to the series was the first program. The second problem is apparent on two counts: Goldin cites these as the first nine programs but cites a 1953 [approximate] date. The series actually began on September 24, 1951, and the first ten programs of the original broadcasts bear no resemblance to Goldin's cited order--other than the mention of Edward R. Murrow. Either this was, indeed, the order for the first nine programs in some broadcast outlet in 1953, or they're simply incorrect as to order or dating--or both. Without any geographic clues, tracking back to the radioGOLDINdex's dating or sequencing is all but impossible at this point. If there were only twelve series, and a 'series' constituted twenty-six episodes, that would give a theoretical total of 312 unique interviews. Substituting thirty-nine as the number of interviews in a 'series' would yield 468 unique interviews. And of course, substituting fifty-two as the number of interviews in a series would yield 624 unique interviews. There are any number of problems with the above calculations. It seems apparent that the various tapes that comprised the series were often mixed and matched for a particular purpose. And many of those tapes would have had repeats of previous interviews from the series compiled for a specific purpose. There were probably more than twelve unique 'series' ordered for the production over the three years that it aired in original broadcasts. Without knowing how the tapes were compiled, we're still in the dark as to whether--or not--every working tape contained a fixed--or variable--set of interviews. It would appear that the 10" tapes in the Tufts collection could contain between twelve and eighteen, 4-minute 25-second interviews per 10" magnetic tape--if recorded at 15 inches per second (ips). 30ips would have yielded approximately half that number of interviews per working tape. Broadcast outlets throughout the Midwest and small markets were airing either one-interview or three-interview broadcasts--either three times per week or Mondays through Fridays. We also know that repeat broadcasts were heavily represented both in first-run and most subsequent runs of the series--as late as 1955. There are at least a reported 800+ unique personalities [including pre-20th century] from the 1951 to 1955 recordings readily available from various sources, including newspaper listings, the Tufts archives, National Public Radio, and actual circulating recordings. And finally, the AFRS cites an initial intent to provide 714 recordings [and possibly an additional 200 for a total of 914] to its facilities throughout the world within its canon IED-239, 'This I Believe.' Those may have been mix and match compilation discs--or tapes--and may well have contained many repeats within the canon. We therefore believe that a reasonable estimate (including historical figures) might be between 820 and 914 unique essays, whether contemporaneous to the original run or from 19th century and earlier historical figures. In theory, given a start date of September 24, 1951 and an end date as late as March 25, 1955, the potential yield of broadcasts would be approximately 905 broadcasts of weekly, Monday through Friday, five-minute essays. But of course as we can demonstrate below, for at least the first several months there were a representatively large number of rebroadcasts. And indeed many of the circulating recordings are announced as rebroadcasts. This would bring a more likely number of total, unique broadcasts down into the high 700 or low 800 range. We feel certain that the actual number of originally broadcast essays will fall within that range. As must be obvious with the initial log below from WCBS' listings in the New York Times, This I Believe and its guest essayists can only be accurately tracked through the first ninety-four broadcasts. From that point forward--in the New York Times, anyway--the broadcasts are presented only as 'grid-listings.' We currently have 184 recorded essays among our own holdings, and some forty to sixty more known essayists from other sources. We've presented a compilation from all known sources in the final, alphabetical listing below. We're also well aware of the numerous circulating logs of other individuals and groups citing original broadcasts as early as 1950 and as late as late 1955. We have no idea where they obtained that information--or what they have to back it up. We're as intrigued as anyone by the citations of broadcasts as early as 1950--fully eighteen months before the concept was fully developed by Edward R. Murrow. We leave it to our readers to determine the source(s) you trust in cataloging your own This I Believe canon. Short of an engineering log from WCBS, we find it highly implausible, if not impossible, for any of the currently circulating episode numbers--or dates--to be entirely accurate for this series--National Public Radio, notwithstanding. 11:30-WCBS--This I Believe; Edward Morgan - guest. Birthplace: Greensboro, North Carolina, U.S.A.
1957 Fifth Anniversary Salute Of "Operation Skywatch"
PAWLING, N. Y. (UPI)Edward R. Murrow, 57, one of the nation's most famous radio-television commentators who took a quarter million dollar annual pay cut to serve his country as head of the U.S. Information Agency, died Tuesday of cancer. He put his microphone on the sidewalks of London to get the sounds of people walkingnot runningto bomb shelters during the blitz. He chartered an airplane and then rode a streetcar into Vienna one-half hour ahead of the Wehrmacht to get the sounds of their goose-step beating down the streets. He described the dead bodies at Buchenwald. He was an international ambulance chaserthe man on the scene of floods, hurricanes, tornadoes and war in Asia and the Middle East as well as Europe. Murrow was born in Greensboro, N. C., on a tenant farm. His father was a man "who never actually said there was anything dishonest with making a living by talking." He was making more than $300,000 a year with Columbia Broadcasting System (CBS) when he left in 1961 to run and revamp the USIA, for a salary of $21,000. Friends said the globe-trotting newsman was a "human dynamo running on nervous energy." He slept only four or five hours a night for years, they said, and puffed continuously on three packs of cigarets a day. In October, 1963, Murrow had one lung removed because of cancer. He recovered sufficiently to return to his USIA post, but it rapidly became too much for him and he resigned the following January to complete his recuperation. Last November, he went back to the hospital. Doctors said he had to undergo surgery. The hospital refused to explain the exact nature of the operation, but reported he was making a "nice recovery." However, he did not leave the hospital until his ambulance trip home to die three weeks ago. For nearly 25 years, Murrow was the most valuable property of CBS. He was made a vice-chairman when he returned from Europe, but he disliked administrative work--"especially firing people"--and resigned that post. He served on the network board of directors. With the advent of television, he became virtually a member of the family circle in millions of American living rooms with his "Person to Person" weekly show and his monthly "See It Now." His handsome, bushy-browed face had a natural worried look that was appealing to women. And his tweedy, man-of-action appearance was popular with men. His intellectuality had a common touch. His social conscience generally showed. 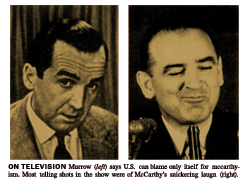 One of his most sensational productions was the 1954 telecast that attacked Sen. Joseph B. McCarthy by using the senator's own quotes. The show violated CBS' non-partisan policy. The network received more than 50,000 letters about the show. They were four to one in favor of Murrow. The network stood by him.